Virtual Garage Sale! 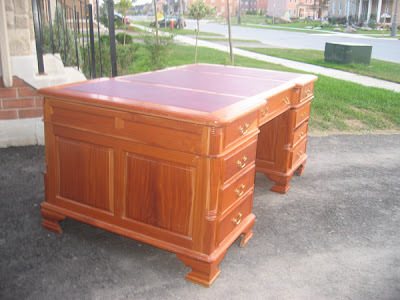 Please buy my Awesome Partners Desk! This is your chance to own a piece of “Saul Colt” memorabilia. 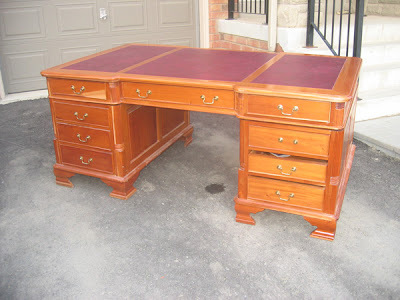 I am selling my Partners desk that I have had for over 15 years. Calling this a desk is an insult to it since it is closer to magic. In the 15 years I have loved this gigantic piece of carved wooden love I have sat at it to write 11 unproduced screenplays, 22 comic books, 2 business plans, one optioned adult film that still has not been filmed and many other wonderful things. 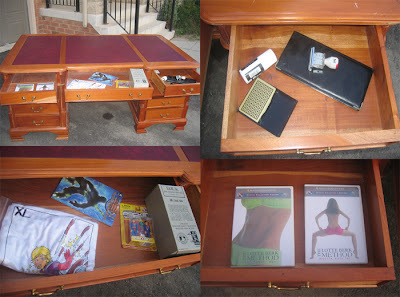 This desk has followed me around to many homes and while I have not made sweet sweet love on it I did get to “second base” with a pretty lady sitting on it. – one “paid”stamp-assorted comic books I have written. Please Note* This is a huge piece and would require a van or something to move it but it would be well worth it! I also have a very ordinary solid wood “L” shaped desk in great shape that I would give up for $150 if anyone is interested…..as you can tell I am trying to go minimalist in my home. Are you willing to sell just the contents….ha! I have more desks with more treasures so if it is the contents you want drop ma a line and I will make you a goodie bag…..at a great price! A grabbag goodie bag? I want one how do we play this game? I know there will be a cost involved, but surprise shopping is one of my favorite things to do!